Publication details: Book. 1999. vii and 177 pages. Publication date: 1999-04-07. 70 figures and 11 tables. Paperbound. The diagnosis and treatment of acoustic neuroma can be considered a major goal of the 20th century. The assessment of auditory brainstem potentials and the use of magnetic resonance have made it possible to evaluate an increasing number of patients. The triumph over acoustic neuroma has been achieved using two methods: auditory evoked potentials and eight nerve neuromonitoring, which has also been extended to the other cranial nerves. This book will be a great asset to both young otologists and experienced specialists alike. The diagnosis and treatment of acoustic neuroma within an otological context can be considered one of the major goals to be achieved before the end of the 20th Century. The routine assessment of auditory brainstem potentials and, more recently, the use of magnetic resonance, have made it possible to pinpoint an increasing number of patients to be evaluated for surgery or alternative strategies. The 'country road' followed at the start of the 1960s by William House and his collaborators has nowadays changed into a 'super highway' run by several prestigious neurootological centers from all over the world. 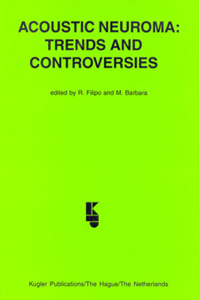 This book contains all the contributions presented at the Round Table on Acoustic Neuroma: Trends and Controversies, during the XXVth Meeting of the Italian Society of Audiology, held in November 1997 in Rome. It is our hope that it will be of help to those young otologists keen on approaching the problems of acoustic neuroma, as well as to experienced specialists as a welcome addition to their book shelves.